Gosh, we love a good spinach dip. But when spinach dip is made in the air fryer it’s even better because its so easy and convenient! 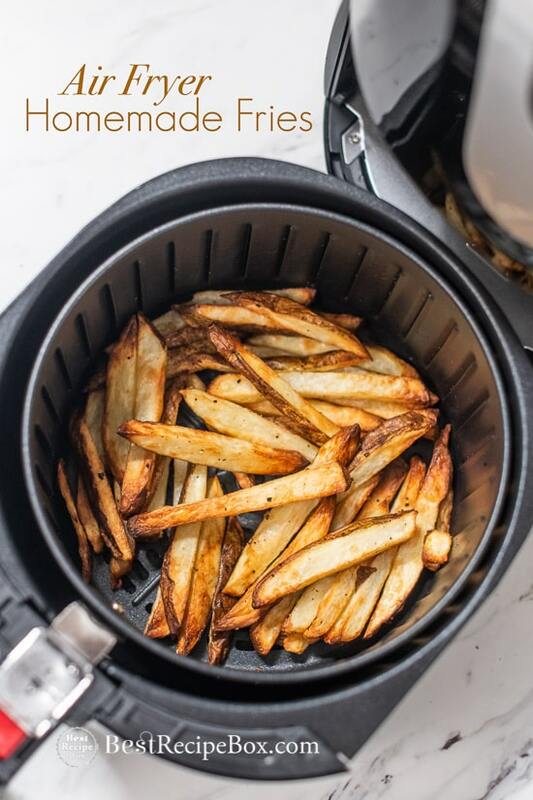 Our collection of air fryer recipes shows that we’re pretty obsessed and we have so many fanatic recipes in the air fryer. We just have to take our time sharing them all! Today, it’s all about air fryer cheese dips and this easy air fryer spinach dip is the best! 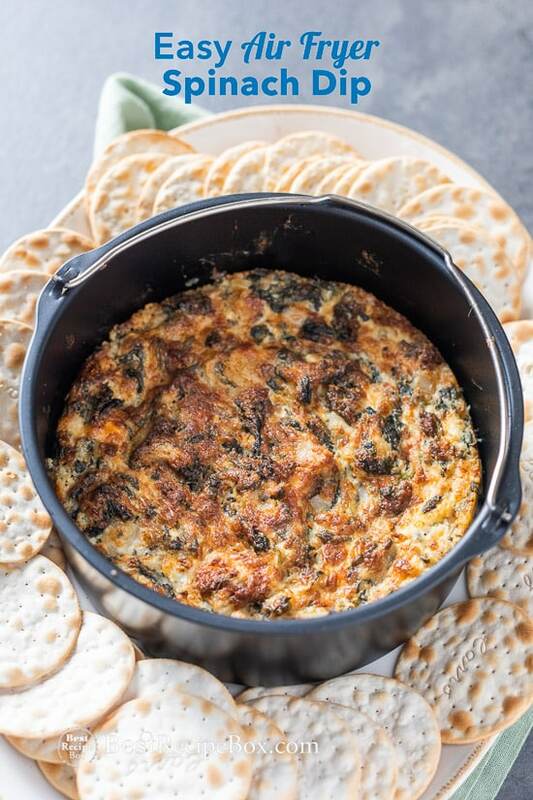 Why this spinach dip recipe in the air fryer is so great is because of all the flavors that go into it. We love using freshly grated parmesan for our air fryer spinach dip. The rich flavors of good Parmigiana Reggiano are even better if you want to splurge. 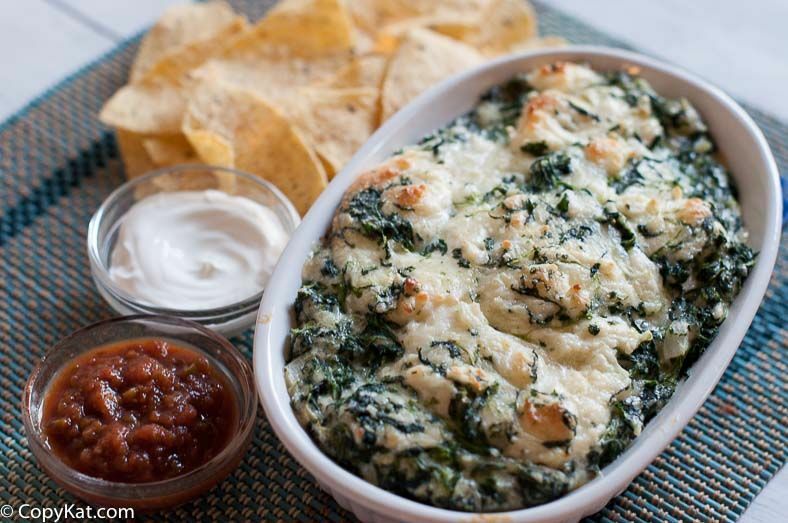 This great spinach dip is ready for sharing and perfect for holidays or game days! Mix spinach dip ingredients together in a bowl. 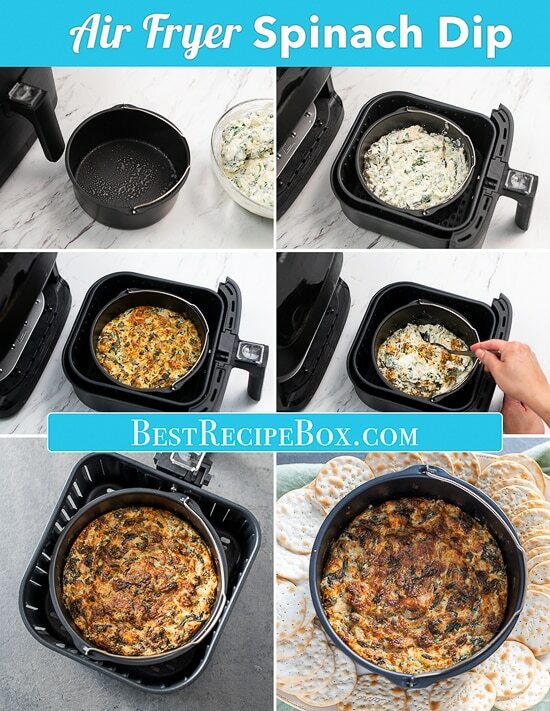 If using a smaller air fryer smaller, finding a baking vessel for a whole batch of dip that will fit in the air fryer might be challenging. You might have to cook it in two smaller, shallow batches or use an accessory pan like we did. It’s a 6″ baking barrel with a handle that is deep enough to fit the whole batch of dip. It’s also small enough to fit our 3-4 qt. air fryers. There’s also accessories for larger air fryers too. If using a larger air fryer or a tower rack-style fryer, finding a vessel that fits the whole batch is easier. Or you can buy the accessories here like we did. Air Fry at 300°F for about 35 minutes, stirring halfway during cooking. We love this accessory kit that has this cake barrel. You can buy it here. This barrel and other accessories is perfect for smaller air fryers. There’s also a set for larger air fryers too. Find a dip vessel to fit your air fryer basket or rack. One full batch will fit in a deeper 6.5”x3” baking dish. If your air fryer is too small or you only have smaller shallow baking dishes, cook the dip in two batches. We love the handled cake barrel because it’s deep enough to fit the whole batch. The deeper the dish, the longer it may take for the dip to cook through. So stirring the dip halfway through helps ensure all the ingredients cook evenly without burning the top crust. Spray the baking vessel *see head note about vessel choice* with cooking spray or olive oil. Combine all ingredients together (cream cheese, spinach, parmesan, mayo, water chestnuts, onion, garlic powder, & black pepper) in a bowl. Mix to completely combine. Add the dip mixture into the baking vessel(s). Air Fry at 300°F for 35-40 minutes. After cooking for 20 minutes, stir the dip, and then continue cooking for 15-20 minutes or until golden brown. If cooking anything less than the full volume of dip, cook for less time and keep checking until it’s finished with a brown crust. 0 Response to "Easy Air Fryer Spinach Dip Recipe"